Lush is at it again! Because these Spring goodies would make anybody happy, I decided to share a review with you so you know what to expect when you invest in these beauties. 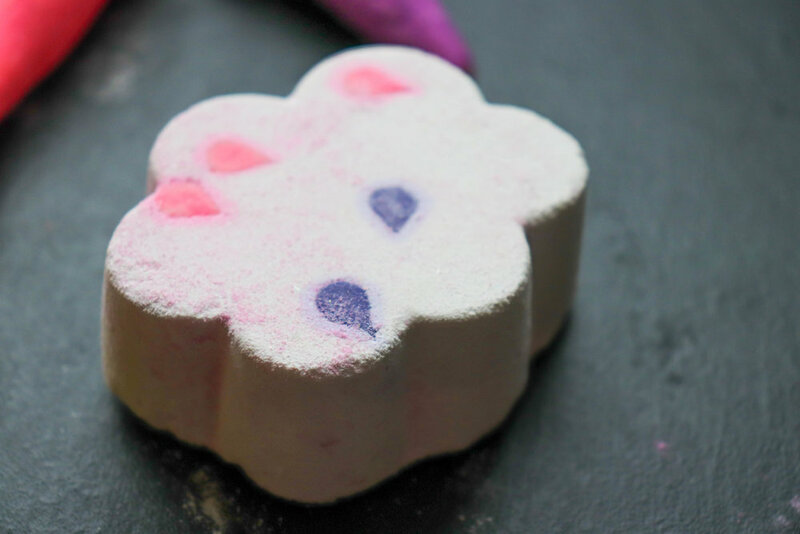 I just thought it would be more than fitting to start off this post with this sweet bath bomb called April Showers (seeing it's already April now, eek!). I tried this baby out with my little girl and boy, did we love it. April Showers starts with loads of pink and purple fuzzies, which later transformed into this milky consistency. We ended up with a cloudy (no pun intended) pastel pink bath which smelled of a mix of baby powder & flowers. I was absolutely in love with this bath, especially because it left my skin baby smooth and the smell literally lingered around me all day. Recommend! First of all, can this design get any cuter? I literally gasped when I saw this fella. Especially with that soft little tush. Wash Behind Your Ears is a shampoo bar that smells like lemon with the tiniest hint of rose. I'm usually scared when it comes to lemon-scented shampoos, because my hair is dry enough as is, so I decided to use this shampoo bar after trying out one of Lush's hot oil treatments (but more on that in another post). I must say, I'm in love with the scent and how it lathers up, but I expected a bit more from this shampoo bar. It didn't wash out my oil treatment like I expected it too, so I guess it isn't so cleansing/drying as I thought it was. I will still give this guy another try (no rhyme intended), so I'll make sure to update this post as soon as I've washed my hair 'the regular way' (being without an oil treatment). So stay tuned! First of all - can we have a moment here to appreciate this cute bundle of joy? You'd almost think like this Bunch of Carrots has just been plucked from your little organic urban garden, but these carrots are easy on the eye and easy on your skin. I've only used the pink one (because my daughter insisted I use up the pink one first; pink over everything), but I reckon that they're pretty alike. First things first: These will last you a long time. I've used the pink one for 2 baths already and he's just a bit smaller than before.. and I still have 2 other carrots to go! So yeah, definitely a good bang for your buck there. When it comes to smell, only one thing comes to mind: Fresh. 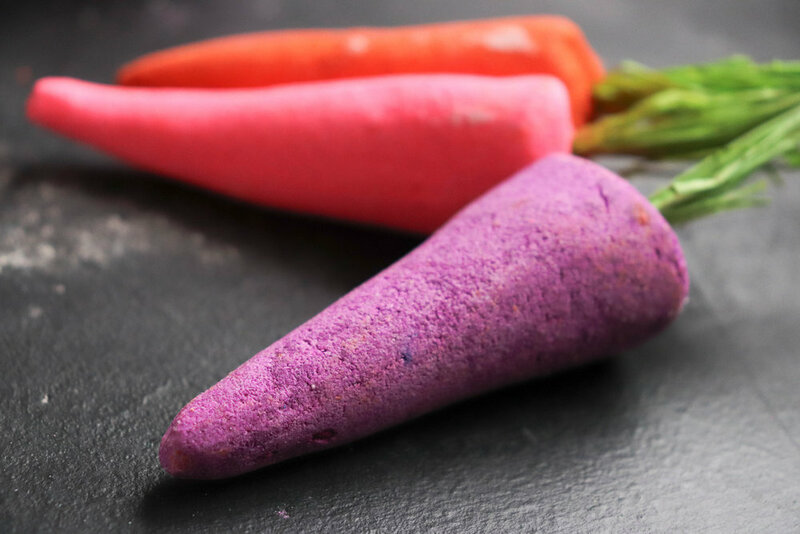 Baths with these babies will leave you feeling refreshed, in a Spring kinda way. Recommended once again! Now I must admit, these Naked Shower Body Creams and Gels confused me for a minute. Isn't this just soap in the form of a bottle? Because I can't stand soap and how it makes my skin feel (extremely dry). So you can imagine I had my doubts when I tried these out at first. Well, I can tell you 1 thing: This isn't regular soap. This is literally their regular shower gel/cream, but in solid form. This guy in particular smells like tangerine and is extremely soft on the skin. It leaves you looking like a little clean and glowy carrot (= really orange) when you apply it at first but this beautiful colour washes right off, so don't worry. Regular soap forces me to apply a huge load of moisturiser after my shower, but after a shower with this body cream my skin is hydrated enough to even skip the moisturiser some days! This guy will also give you a good bang for your buck, because it's just slightly smaller than it was when it became a part of my shower-product family about 2-3 weeks ago. Recommend! Lets finish this blog post on a high note. This guy right here is right up there with April Showers when it comes to my favourite Easter/Spring pieces. This Free Rangers bath bomb can be split in 2, thus used for 2 amazing baths. Now that alone made me extremely happy. Double the joy! I do find it really hard to explain the smell of this guy; just like the rest of the range, it smells kind of sweet, but especially uplifting and refreshing. There are some hints of black currant in there, combined with a beautiful bergamot oil. This will result in a not-so-bubbly but definitely relaxing bath that will leave your bod (and mind) happy. Recommend! So what do you think? Do you have any faves?